These lovely enamel pin badges have been specially cast for M.E. Support. 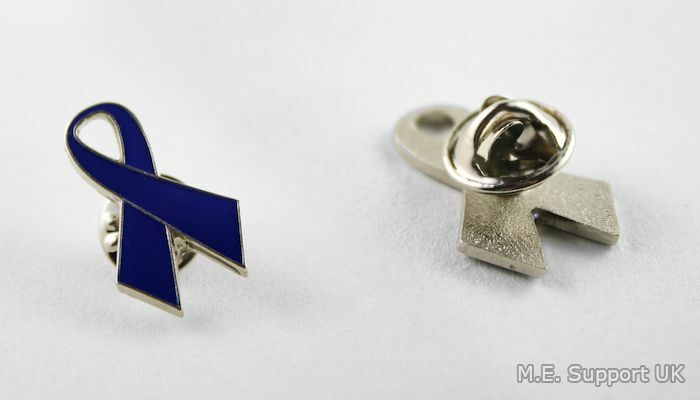 This plain blue ribbon design is suitable for Myalgic Encephalomyelitis, Fibromyalgia, Gulf War Syndrome and Multiple Chemical Sensitivity. The badges are 25mm long and measure 14mm at the widest point (image not actual size). They have a nickel finish and a secure clutch pin fitting. These subtle badges are perfect for your jacket lapel and can be worn throughout the year. They are a great investment at just £1.65 each. These badges are individually packaged in protective plastic bags. If you would like to place an order from outside of the UK, please Contact Me for an international delivery quote.